Corn is a starchy vegetable that, when boiled, offers several nutrients that can help you stay healthy. Corn is in season in the summer but is available frozen all year. Store ears of corn in the refrigerator, but cook them as soon as possible to preserve nutrients and taste. 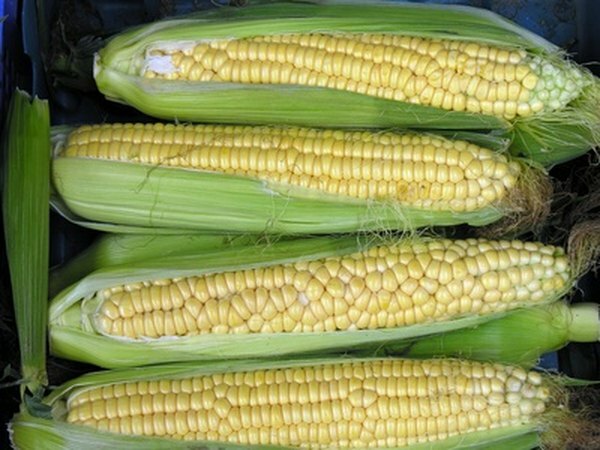 Frozen corn keeps much longer than fresh corn, and you can enjoy it without having to cut it or eat it off the cob. Vegetables are a healthy addition to a low-fat and low-calorie meal plan, which helps you lose weight or maintain your current number. Adults should get 2 1/2 to 3 cups of vegetables each day, and filling up on them leaves less room for junk food. A cup of boiled corn contains 143 calories and about 2 grams of fat. Keep in mind, however, that putting butter on your boiled corn increases both fat and calorie intake. Carbohydrates are the main way your body gets energy for everyday tasks as well as exercise. Aim to get 45 to 65 percent of your daily calories from carbohydrates. The Harvard School of Public Health notes that you should get most of your carbohydrates from fruits, vegetables and whole grains, which are healthier than those that come from baked desserts and sugary drinks. A cup of boiled corn contains about 31 grams of carbohydrates. Corn is a healthy way to increase your vitamin C intake, with 8.2 milligrams per cup when boiled, which is 11 percent of the 75 milligrams women need each day. Vitamin C keeps your immune system healthy and aids in wound healing. It is also an antioxidant, which means it helps fight the free radical damage that could result in the development of cancer. Eating foods that contain vitamin C allows your body to more efficiently absorb iron from your meals. Pairing boiled corn with grilled chicken is a good way to benefit from this. Fiber is a nutrient your body uses to prevent the absorption of cholesterol into your bloodstream, so getting enough of it helps you keep your cholesterol levels under control. In addition, fiber helps regulate digestion and bowel function and can help relieve constipation and symptoms of irritable bowel syndrome. Adequate fiber intake can also help you control your appetite and weight because it digests slowly, keeping you feeling full for longer. A cup of boiled corn contains 3.6 grams of fiber, which is 14 percent of the 25 grams women should include in their diet each day.